All along the south side of the trail near the sign for Stop 4, you will see medium-sized shrubs with glossy, dark green leaves. If it is winter or early spring, you may also see bright red berries on some of these shrubs. This is the Yaupon Holly, an evergreen native shrub that is one of the most common understory plants in east Texas. The scientific name of the Yaupon Holly is Ilex vomitoria. It got this name because the Karankawa Indians of East Texas used a tea made from yaupon leaves as part of a ritual cleansing ceremony. So don’t ever eat these plants – they’ll make you sick. Yaupon Holly is similar in appearance to the Chinese Privet, an invasive non-native shrub. The native holly can be distinguished by the bumpy edges on the leaves and the bright red berries, compared with the smooth-edged leaves and dark blue berries of the privet. Another way to distinguish between the native Yaupon Holly and the Chinese Privet is to look at the placement of the leaves along each branch. 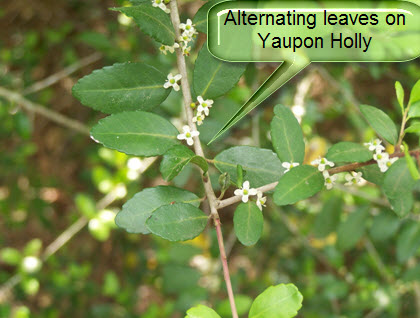 The Chinese Privet has paired leaves opposite from each other, while the leaves of the Yaupon Holly occur one at a time on alternating sides of the stem. When yaupon berries are ripe, they turn bright red – usually in winter or early spring. This provides an important source of food for winter and migratory birds. Although birds will eat the berries of both the native holly and the Chinese privet, insects, which are very particular in what they eat, predominately dine on the native holly. Look closely at the leaves of the native holly and you will see small holes that are signs of insects feeding on the holly. This is important because insects are vital to the chain of life in the forest. If they feed on a plant, they will control the growth of that plant. They in turn will provide food for other creatures. Insects provide an incredibly rich source of protein. For this reason, species of birds that normally eat seeds as adults will only feed insects to their young. If the number of insects declines because the native foods that they like to eat are being replaced by non-natives, the number of birds will also start to decline.